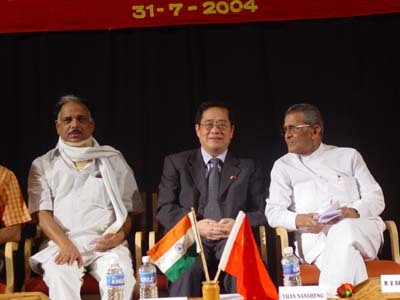 On the afternoon of July 31, India-China Friendship Association Karnataka Chapter held the Commemoration Meeting of the Fiftieth Anniversary of the Proclamation of the Five Principles of Peaceful Co-existence (Panchsheel) in Bangalore, capital of Karnataka. Among nearly 200 attendants were Consul General of China in Mumbai Yuan Nansheng, local senior government officials and representatives of various circles. Indian Union Minister of State for Planning M. V. Rajasekharan and Director of UNESCO New Delhi Office also came to attend and address the meeting from New Delhi. In his address, Minister Rajasekharan talked cheerfully about the impressions of his visits to China in recent years and spoke highly of the great achievements made by China since reform and opening-up. He said that India and China were highly complementary in various fields and should learn from each other and further cooperation. He noted that the issues left over from history should not be the obstacles affecting the development of friendly ties between the two countries. He expressed that he was looking forward to the day to come earlier when India and China become world powers with the friendship and cooperation between the two countries. Consul General Yuan expressed in his address that China and India were friendly neighbors and the maintenance and development of the friendly and cooperative relations of China and India conformed to the fundamental interests of the two peoples and were conducive to peace, stability and development of Asia and even the world at large. In the evening, Karnataka Speaker Krishna hosted a banquet for Consul General Yuan and his party. The banquet was also attended by Minister Rajasekharan, Karnataka Water Resources Minister, Industry Minister and Legislative Council Chairman.